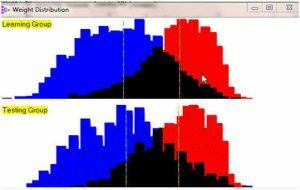 Published on the web 8/19/2011Click here for printable copy.Neural Net mathematics is a phenomenal tool to use in research. 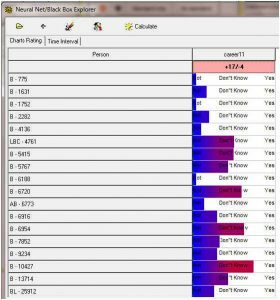 After creating a model with thousands astrological criteria, the criteria is sent to a research program that compares your sample against control group and calculate the importance of each. It will list all the criteria that are important which we call OFTEN as well as those considered not important which we call SELDOM according the chi-square and probability in mathematics. This list is then sent through the Neural Net mathematics. Neural Net will make sure that this list of criteria consistently indicates if it’s often or seldom important. The following two graphs are the result of research that we’ve done in predicting winners in sports games. Through our research studies we found that astrology is not dependable to predict winning outcomes in sport events. You can see from this graph that Neural Net didn’t find it very clear after using thousands of criteria to see if any of them happened often or seldom. The blue part of the graph indicates the strength of occurrence for Seldom and the red indicates the strength of occurrence for Often. The black portion of the graph refers to findings that are not important. Now if you compare this graph to the next one you will see the results of a breast cancer research that we’ve done. 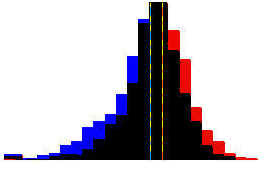 Notice how the results of seldom (blue) and the often (red) are spread away from the black part of the graph that shows not important at all. The further that the blue and red colors are from the center the stronger the often and seldom are for all these thousands astrological criteria used in this study. 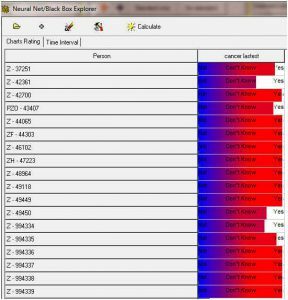 Neural Net creates an artificial intelligence that you can use to check your results with other natal charts. Let’s take another look at the research for predicting sport events. Using the artificial intelligence that neural net created, we then we took over 9000 timed sporting events to see how well that they fit the model that was found in the research. This data was focused on predicting the winning teams when they played at home. In other words we input thousands of timed charts with locations of sport games where the team won at home. As you can see the result wasn’t that great because the strength of each game was weak. Next, we used games when the home team lost at home. After sending it through the artificial intelligence created by the team winning at home, the results were not very different at all. This indicates that all the astrological criteria that was important when the team won at home is not any different that when the team lost at home. That tells us that we cannot predict the outcome of sport events with any accuracy using astrology. Now let’s take a look at some other research that produced some stellar results. The next graph shows the our results from a research of breast cancer. We sent new charts of people with breast cancer through the artificial intelligence file and the graph indicates that all of them would have breast cancer, and they did. The next graph uses the same artificial intelligence model that we used for breast cancer. This time we sent through the charts of individuals with bone cancer. As you can see very few of them would have qualified to have breast cancer. This a good indication that the research produces great results. Now if the bone cancer study would give the same results as the breast cancer study, the indication would be that the research did not find any important criteria that are particular to breast cancer. This is exciting it proves that we can predict woman having a possibility of breast cancer in this lifetime with good accuracy. Copyright © 2011 Astro Investigators.